Many systems consist of a mixture of various resource types that together support better performance relative to those with a single resource type. One important characteristic of these systems is the fact that the various comprising resource types can operate on different timescales, implying that the corresponding control decisions are not made simultaneously. 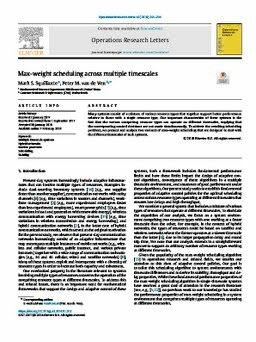 To address the resulting scheduling problem, we present and analyze two variants of max-weight scheduling that are designed to deal with the different timescales of such systems.